We’ve had some cold days as of late here in Fort Collins, and more snowy days are undoubtedly just around the corner. While snow is certainly beautiful to look at, snowy roads and sidewalks are the cause of many preventable accidents. In today’s post, we’ll provide you with a few important safety tips you can use to keep yourself safe this winter. Advanced Landscaping & Sprinklers, Inc. is proud to be Fort Collins’ premier landscaping company. We know that snow removal can be an inconvenient hassle, so give us a call and learn more about what we can do for your home or business! Shoveling promptly is one of the best ways to keep yourself, and others, safe during the winter. 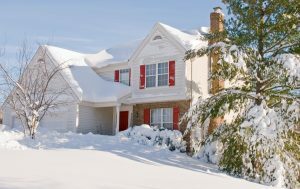 Many people avoid shoveling in the morning with the intention of shoveling later in the day, but waiting to clear your property until the snow completely stops makes it much more difficult, and exhausting, to get the job done. Instead of spending your entire evening chipping away at built-up snow piles, shovel once in the morning and then again in the evening. Alternatively, you can call our Fort Collins snow removal experts to take care of the hard work for you! Remember that while clearing your property is important, it’s not worth hurting yourself in the process. Slip-and-fall accidents are far too common in the winter. Whether you own a local business or a home in Fort Collins, you can do your part to keep others safe by liberally spreading a de-icing agent around your property as you shovel. Additionally, make sure that you’ve placed rugs or runners on non-carpeted surfaces to prevent slips from occurring indoors. Check that your tires have sufficient tread for the season, and replace them if they don’t. Leave plenty of distance between yourself and other vehicles. If you get stuck, don’t spin your wheels. Call for help, or rock your vehicle back and forth. Keep a shovel, ice scraper, and a de-icing agent in your vehicle. Contact Our Fort Collins Snow Removal Experts! We hope that these tips will help you stay safe this winter. Contact Advanced Landscaping & Sprinklers, Inc. to learn more about our Fort Collins snow removal services!